As we learned about the true extent of Fukushima accident and nuclear fallout, our feeling toward the government, the energy industries and the media shifted from distress to distrust, then to disgust. Many people, from independent journalists to political activists, from artists to housewives, used the term “the Great HQ Announcement” to describe this failure of major media to deliver vital information and critical view of the Fukushima incident. This term has its roots in the days of the Pacific War. Originally, it was the official term for government reports of the war status. During the war, the newsreel, the radio broadcast and the newspaper articles cited “the Great HQ Announcement”, which was their primary sometimes only source of releasable information concerning the war at the time. First couple of months were sort of okay. The Pearl Harbor attack was considered a success and “the Great HQ Announcement” was full of self gratification. But for the rest of the war, it’s downhill for Japanese military commanders. Less and less successful missions, more and more casualties. Japanese government began fabricating figures, data and status about its war effort to save its face and “the Great HQ Announcement” became collection of nonsense. For example, according to Japanese Great HQ, two U. S. aircraft carriers were sunk during the Battle of Midway in 1942, but in reality it was only one (USS Yorktown). As the war progressed, Japan losing its strongholds rapidly, this art of fabrication became fantastic. 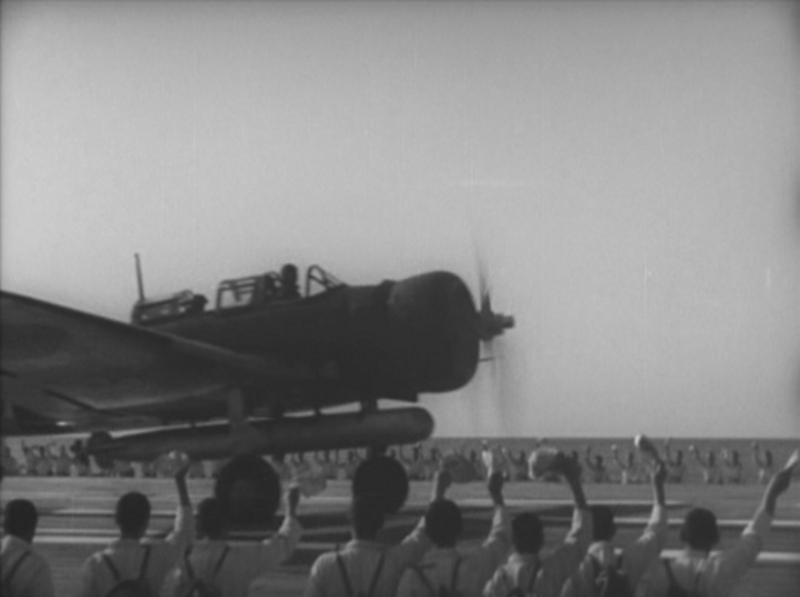 In Formosa Air Battle, Japanese Navy Air fleet sunk 11 U.S. Aircraft carriers. Yes, 11. In reality, no aircraft carrier was sunk. When people came to know the facts of the war and of sleazy cheating by its own government after the war, they were appalled and dismayed. Since then, the term “The Great HQ Announcement” has become sarcastic comment on our government’s tendency to hide undesirable facts. Back in the days of the WWII, under the total control of the regime, Japanese media and press cooperated to create the images of invincibility in order to reinforce their illusion about the miraculous victories. The government wanted to project the image of this undefeatable empire to the public. They needed a proof, so they invented it. They invented the idea of the secret, ultimate weapons. It’s a cruel, cruel trick on boy’s imagination they played with. During the same time period, cinema itself provided images of glorified mechanization of war. The film studios were not ready to play with fantasies of “ultimate weapon”, yet, but one of the studio, TOHO, was willing to provide the most realistic reenactment of the victory of 1941. The film was “Hawaii, Malaysia Sea Battle”, released in December 1942, exactly one year later the Pearl Harbor attack. The main attraction of the film was the realistic air-strike scenes. The miniatures, dioramas and special effects for the scene were done by none other than Eiji Tsuburaya. The film is considered the pinnacle of the Japanese war propaganda, both in its quality and its effect. Though it was produced under the order of the Japanese Ministry of Navy, its production was full of troubles and obstacles. Navy denied the production team any access to confidential information regarding designs, mechanics and even the appearances of its vessels, Tsuburaya had to figure out the visual layouts and designs of warships and aircraft carriers from limited information from newsreels and newspapers. Since they used the real fighter planes for shooting, they built the life-size aircraft carrier set in the back lot. These separate images were smoothly blend into one seamless sequences. The final product was so realistic that even the U.S. Occupation Forces believed it was the real footage. When the war was over, these products of imagination, either fantastic war machines for kids or dioramas for the Pearl Harbor attack, survived to become the origin of postwar Japanese animations, especially Robot/Mecha animations. Even though it is debatable whether EVANGELION is Robot/Mecha Anime in the strict sense, it is the direct descendant of early popular shows such as MAZINGER Z, SPACEBATTLESHIP YAMATO, GANDUM and MACROSS. All of these Robot/Mecha Anime have one thing in common: these robots are secret ultimate weapons to fight against entities which terrorize humanity. The genesis of Robot/Mecha Anime can be traced back to 1950’s. “TETSUJIN 28” was the most popular Manga and animation in the era, and even though it’s before my time, I am familiar with this Yokoyama’s masterpiece. TETSUJIN 28, the invincible robot controlled by a remote controller, fights against the league of evil bandits and scientists (when the controller is in good hands). 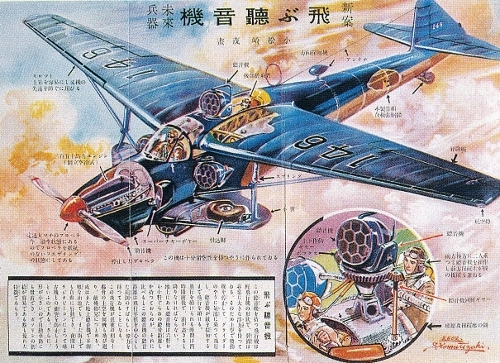 TETSUJIN 28 was the product of secret weapon project by Japanese military during the last days of WWII. Another popular robot Manga of the era was, of course, “TETSUWAN ATOM (ASTRO BOY)”, created by Osamu Tezuka. Though this robot itself is not conceived as a weapon, its source of power is the heart of all secret weapons of WWII; the nuclear power. However, as Japanese society became more proliferated economically in seventies, these questions became less relevant. We were more concerned about the perfectness of material, machines and merchandise.